Method: Put all the dry ingredients in a food processor. Pour in the oil. Blend the heck out of it until it is precisely the texture you like your pesto to be. You can also grind all the ingredients together in a mortar and pestle if you have a good one. I don't. Recipe notes: Pesto freezes very well so if you have a ton of basil and can get your hands on all the other ingredients, I suggest you make as many batches as you can to enjoy during the cold months of winter when mired in root vegetables and dreaming of the taste of summer. I recommend using a vacuum sealer if you have one for the best possible quality. *Chelsea and I have a stylistic difference of opinion on the amount of salt necessary to make this pesto shine...I like one and a half teaspoons, she likes two. Basically, use as much as you think is best. great green goodness! love the simple recipe but i totally am in longing for your ramekin/crock that it is in!!! my big favorite is how easy it is to use once it is made...pesto on 'wichs.....pesto on eggs....but I prefer walnuts, not that you care, lol and i have made it with cilantro with easy substitution! thanks for the new item to lust after! I love my ramekin too! It's made by Pillivuyt, but that pattern was discontinued and whenever I find it still being sold somewhere they are now insanely expensive. I've done this recipe with cilantro too and it was very good. I like pesto made with walnuts too but I prefer the pungency of pine nuts. The most important thing is to find a recipe whose proportions suit your tastes- for us this is the best ratio of ingredients. We added more cheese than some recipes call for because we like it that way. 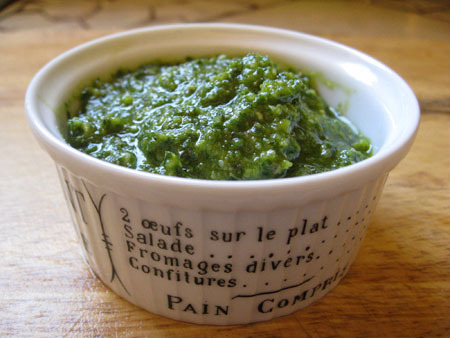 Pesto is one of those great sauces that can be personalized in hundreds of ways.